Known by the name of Pearl of Salento, Gallipoli boasts ancient foundations as revealed by its name which derives from the Greek kalé pólis meaning beautiful city. Conquered by the Romans in 265 BC, after the fall of Taranto, the City of Gallipoli rightly entered the Via Appia (Appian Way) route which linked Rome to Brindisi. During the Imperial period, Gallipoli enjoyed a period of development as a commercial port along the route towards the Balkans, Greece and Western provinces. With the decline of Rome, it had to suffer devastation by the Vandals from Africa who disembarked in Puglia in 450 on their way to plunder Rome. It became part of the Ostrogoth Reign in 496 and was then the centre for clashes between the Byzantines of Belisario during the Greek-Gothic War (535-553), which permanently cancelled the Ostrogoth people from history. In the field of conflict, Gallipoli was plundered by the Goth King Totila in 542 AD. It was immediately rebuilt by the Byzantines and fortified to better defend the fleets assigned in the port. Gallipoli became a Episcopal seat in 551 AD and acquired major importance. The Normans arrived during the 11th Century and allowed the whole region to enjoy a period of major development and well being, which was carried out under the Swabians (1194-1268) with Federick II and his son Manfredi. The Angioini, led by Carlo I, were called by the Papacy to vanquish the Swabians. They besieged the City from October 1268 to May 1269. Under the Angiò, Gallipoli, like all of the South, endured economic politics. In the 15th Century the Aragonese, who were already present in Sicily for two centuries, came to power. They inaugurated politics for development of the commercial port, guaranteeing a new slant to the economy in Gallipoli. Besieged for three days by the Venetians in 1484, Gallipoli was conquered but only kept for a year by Venice, who then had to surrender it back to the Aragonese. Its strategic importance put it at the centre of battles and for this reason, it was once again besieged in 1501 by the Spanish and the French in 1528. With the ascension to the throne by the Bourbons in Southern Italy (1734), Ferdinand I of Bourbon, gave start to the construction of a new commercial port. In 1860 the City became part of the Reign of Italy through plebiscitary vote. Today the City of Gallipoli has a strong touristic vocation. But there are many places of interest in the City beginning with the incredible Greek-Roman fountain (III Century BC) which one will come across after the bridge which divides the new city with the old suburb. The suburb is encircled by high walls which go down to the sea and is dominated by the Angioino Castle (13th and 14th Centuries, then modified by the Aragonese during the 15th Century). Unfortunately, a visit is not possible as it is the seat of Command of the Guardia di Finanza (Financial Police). 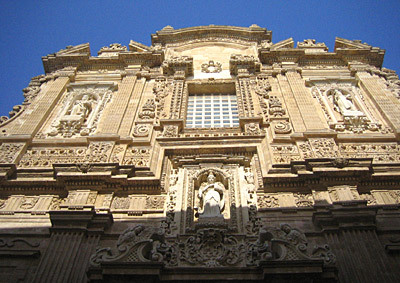 In the centre one can visit the Cathedral of Saint Agata, built in a Baroque style during 1629, on the place where the previous San Giovanni Crisostomo (12th Century) stood. Adjacent to it, one can admire the beautiful Torre dell’Orologio (Clock Tower, 1704-13). Other churches worth visiting are the: S. Domenico of the Rosario, S. Teresa D’Avila, S. Francesco of Paola and S. Chiara. Among the civil architecture we would like to mention the following buildings: Balsamo, Pirelli and Palazzo del Seminario (1752-56). Yearly, on 23rd July, the Feast of Santa Cristina is celebrated, with processions in boats and pyrotechnic exhibitions the following day.